The TitroLine® 7500 KF titrator is the volumetric generalist for a wide range of titration uses. The Titroline® 7500 KF trace is the coulometric specialist for low water content. 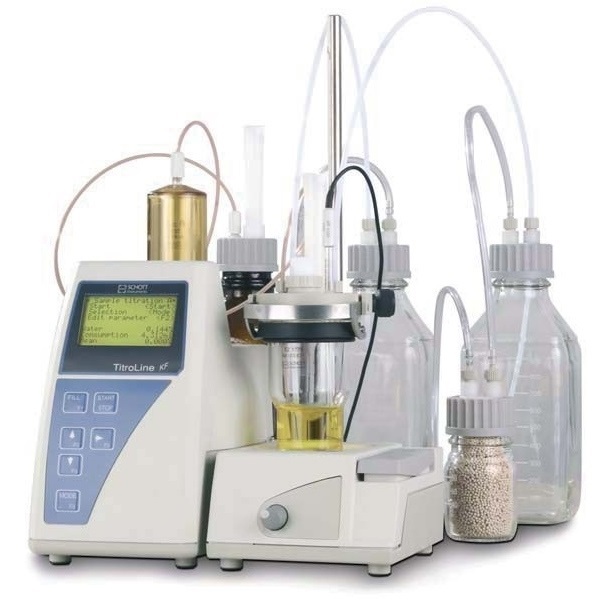 Everything needed to perform a Karl Fischer titration is included in the Schott TitroLine 7500 KF Karl Fischer package. Complete modules for KF tirations, including basic unit, titration stand with pump, titration vessel, micro dual platinum electrode and starter kit. Methods programed as standard include sample titration, titre water, titre liquid standard, titre tartratedihydrate, blank value oven and blank value solvent. 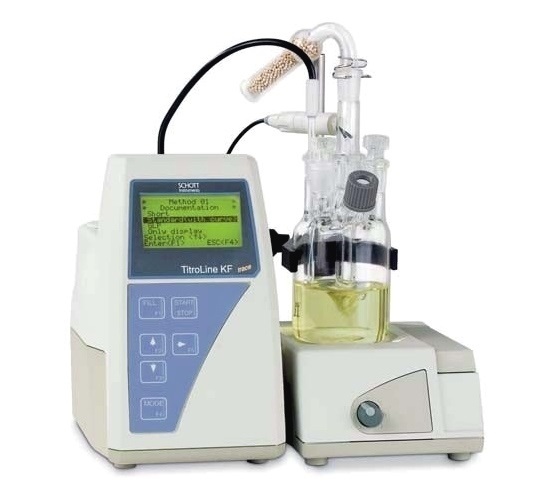 All widely used titration parameters are incorporated in the TitroLine 7500 KF, along with ability to customize them. Any KF solvent can be used and a variable pole voltage assures precision. Solvent and waste removal are handled via the pump/stirrer in order to avoid any handling. Results may be calculated in %, ppm, mg, mg/mL. mg/pc (per piece) and mL (µg for KF trace). Statistics including average and standard deviation can be calculated. Automatic transfer of weights is possible by the RS232 port. An external keyboard can also be attached for ease of use, and a printer for documentation.